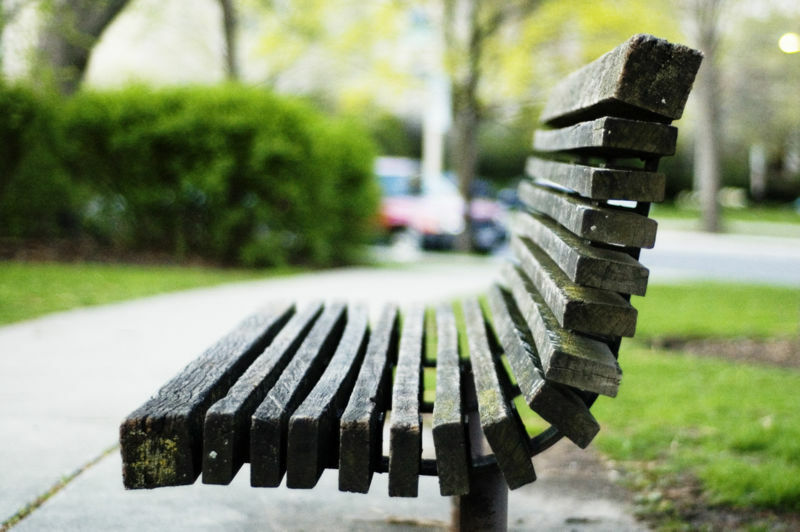 Farcy sat on the park bench with anticipation in his belly. The brown paper bag in his left hand crinkled from the pressure of his grip. He loosened his hand and reached in with his other to pull out some birdseed. The pigeons in the park heard the sound and fluttered over. “The winged rats,” as Cammy would say. The sun beat on Farcy’s forearm as he raised it to look at his watch. Maybe today would be the day that Cammy finally showed up. Farcy would feel his forehead perspire as nine thirty came and nine forty-five passed by, along with dozens of strangers in the park. Ten o’clock would come and there would be no Cammy swishing down the walkway toward him as men gawked while she passed by. The sun would beat on Farcy’s arm (and then his head when he took his hat off, revealing his bulbous cranium) until he was sure, he could feel it burning under the skin. Eleven o’clock would pass by, as the pigeons grew bored of the same seed for brunch each day. “Ain’tcha got nothing else, old man?” Farcy would pretend they said to him as he sprinkled the seed on the ground in front of the bench. He looked down the path to see a tall, striking woman swishing down the path in a bright red dress while people stepped out of her way and heads turned to watch her go by. Farcy’s displeasure at waiting was swallowed by his eagerness to see Cammy. The woman drew closer and Farcy saw that it wasn’t Cammy. He looked at his watch. It was two o’clock. He threw the empty seed bag in a nearby trashcan and sighed. He walked out of the park and stepped to the curb. “Taxi,” he yelled as a cab drove up. He got in the cab and looked at his watch again. “Where to?” the cab driver asked in a gruff voice as he scratched his three-day stubble. Awesome write, Darlene. Very vivid and melancholy. A touching scene, and the ending was perfect, which is not an easy thing to do sometimes. Thank you much, Charles. I am glad you enjoyed it. I love it Darlene, could see the scene. The ending quickened my heart. Aww, Renée… I know… so sad… Cammy passed away a long time ago.. This was sad and touching. Nicely done! Glad you enjoyed it, John. Thanks for dropping by. Sad story, but I like his determination and loyalty. Yes.. sometimes our memories are surreal and they take us to bittersweet places… always glad to see you here. I know… poor guy.. as you said.. you and I seem to be on a similar wavelength concerning flash fiction… 😉 It’s nice to have a partner in storyville. I liked the way you ended this piece! Co-host, A to Z Challenge. Thanks Damyanti… 🙂 So glad you stopped by. Beautifully paced, Darlene. I also liked the construction; the quiet way your story built itself. Thank you, Gabriella.. glad you stopped by! Oh, what a sad story. 😦 I could envision him in my mind, waiting for someone who would never come. I love the way your mind plays a story! Here’s a little thank you for you! aww! you’re a doll, Shan.. 🙂 Thanks so much. I really like your piece! Flash fiction is difficult to write, but you did very well! I love the name Farcy. Thank you Christina.. the name Farcy just popped in my head. It’s so weird.. Glad you enjoyed it.